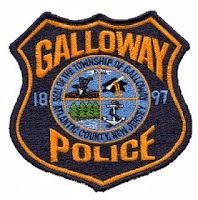 On March 10, 2014, Galloway Township Police responded to a motor vehicle accident involving three (3) vehicles at the intersection of Cologne Avenue and Aloe Street. According to Police, a 2004 Chevy Suburban, which was driven by Wilbert Bernhardt was traveling east on Aloe Street and failed to yield at the stop sign at Cologne Avenue. The Suburban then collided with a Ford Pickup that was traveling north on Cologne Avenue driven by Robert Forshaw. The Suburban overturned and was forced into a Ford Taurus driven by Tyrone Hawthorne, which was traveling west on Cologne Avenue and stopped at the stop sign. The Suburban ended up coming to a final rest on its side against a utility pole and driver was extricated by the Pomona and Germania fire departments. The driver of the Suburban sustained serious, but non life threatening, injuries and was transported to Atlanticare Regional Medical Center City Division. The roadway was closed and traffic was alternated for about an hour and a half. The driver of the Suburban was issued a summons for failure to yield. Galloway Township Ambulance Squad and Germania & Pomona Fire Department assisted. Not the intersection. It is drivers not paying attention because of issues such as cell phones etc. The police need to pay more attention and ticket the drivers. I see people on their phones all the time including Galloway police officers. I do not disagree that people are distracted but that is everywhere and you just do not see that many accidents in one spot for no reason. It is a dangerous intersection. There is no way you can deny it. Then you must be one of the people that I am talking about. Do you use your cell phone when driving? Can't be more obvious that you have to stop! There is a sign and a big flashing red light. Police must agree they gave the person a ticket. The driver who ran the stop sign lives on Aloe St and is familiar with the intersection!!! Not the intersection fault. OK genius. You are right. "Not the intersection fault"
Name another exact spot in Galloway that there are that many, extrication required, calls? You can't. Sure, we get them on 30, just not in the same spot, all the time. We get them on Jimmy Leeds. Again, not in the same spot. Pitney, Quail Hill, Moss Mill... Again, not always in the same, exact spot. You people are dolts. The whole lot of you. Stop by sometime and I will give you a dollar so you can buy yourself a clue.